If you spend any time on the Internet, it’s easy to find a lot of scary information about fluoride and why you shouldn’t let your kids get any. Speaking as a professional, however, I’d like to reassure you that NONE of that scary information is actually correct, and that fluoride in appropriate doses is one of the safest and most effective means of preventing tooth decay available. It saddens me to see both children and adults who’ve been denied these benefits because of myths and misinformation, because those patients almost universally have many more cavities than patients who follow long-proven recommendations. And since the American Academy of Pediatric Dentists recently released new guidelines, this is a good time to review, as there have been some changes. Please ensure your infant and child receive no more than the recommended amount of toothpaste. 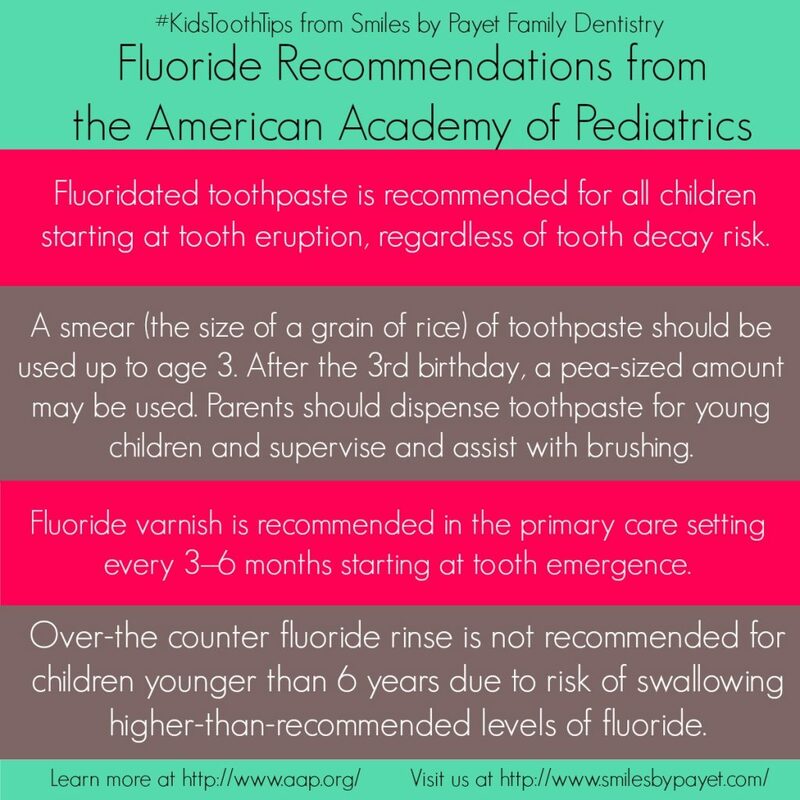 This is for the same reasons that children should NOT be allowed any fluoride-containing mouth rinses before the age of 6: infants and toddlers can’t control their swallowing reflex so as to not swallow the toothpaste or rinse. Eating or drinking too much fluoride can result in a couple problems (see further down the page for details). While it has long been thought that fluoride that is drunk or eaten helps to harden teeth, more recent research shows that the main effect is by coating the teeth and being absorbed. This is why the AAP now recommends starting fluoride toothpaste when the first tooth shows through; it’s also one reason that fluoride supplements are now rarely recommended. Basically, enamel is a mineral matrix, mostly made up of hydroxyapatite, which itself is composed of calcium and phosphate. The way that fluoride works on enamel is kind of complicated, but if you want to learn more, Wikipedia covers it well here: Tooth Enamel and Remineralization. In simple terms, when fluoride is added, it makes hydroxyapatite harder and more resistant to acid breakdown. You can read how the benefits of fluoride were discovered. In most dental offices today, the recommended method of applying fluoride is called a fluoride varnish. Unlike those yucky trays filled with a fluoride foam that sat in your mouth for a minute that older generations had to endure, a varnish is a thick paste that is quickly painted onto the teeth. It’s sticky enough to stay in place and allow fluoride to be absorbed by the teeth for up to 30 minutes, while still at a safe level that children can swallow it without risk. What Are Safe Levels of Fluoride and What’s Too Much? According to current FDA recommendations, the ideal concentration of fluoride in water is a mere 0.7 mg per liter, or 2.66 mg per gallon.1 Most toothpastes available in the USA currently contain 1,000 ppm or 30mg/oz.2 But how much is that in practical terms, and how much would you need to eat or drink to reach a toxic dose? Fortunately, it is EXTREMELY difficult to do this. *For anyone following the comments, I have made several adjustments to my initial statements based on additional information. It has been challenging to find consistent data and sources; in addition, the continued use of pounds and ounces in the USA have required a lot of conversions to and from the metric system. If you find additional errors, please point them out and provide references so that I can verify them. A typical 155lb (70kg) adult would have to eat up to TWENTY tubes (70kg x 52mg/kg = 3640/181 = 20.11 tubes). The greatest danger to infants and toddlers certainly come from mouthrinses, which can be drunk very quickly. Of course, given that many mouthrinses today contain up to 20% alcohol, the child would equally be in danger of intoxication and alcohol poisoning. As you can see, it is basically impossible to take in enough fluoride to be poisoned by fluoridated water, and for large children or adults, it would be equally difficult to reach a toxic level through toothpaste. However, it does demonstrate the importance of keeping toothpaste out of the reach of small children, who could still eat enough to make themselves quite sick. But really – do you think any child would EVER be able to eat even 1-2 complete tubes of toothpaste? They’d get sick long before finishing. Calculations and references available here and here if you want to check for yourself. One important item to remember: fluoride is normally found in groundwater, aquifers, reservoirs, well water, and even in ocean water. In some areas, concentrations are high enough that the fluoride found in local water sources are high enough that no additional fluoride is needed, and, in fact, parents in such areas may need to filter their water to remove excess. This is one real benefit of community water fluoridation, which ensures that no more than the maximum recommended dosage is in the water. 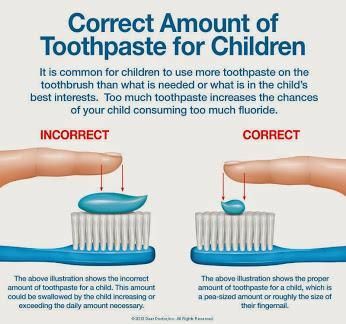 Keep this graphic handy so you can determine if you are applying too much or too little toothpaste to your little one’s toothbrush. What is Fluorosis, and Is It Bad? Given that it’s almost impossible to reach a really toxic dose with fluoride, why do we recommend keeping the dosage so small? It’s because of a condition called fluorosis, which is what happens when too much fluoride is swallowed by a child under the age of 8 (give or take a couple years). The reason there’s an age limit to it is that fluorosis can only happen while the permanent teeth are developing under the gums. Once the enamel is fully formed, it’s no longer possible for fluorosis to occur. Fluorosis is mostly a cosmetic problem though. Why Doesn’t Dental Insurance Cover Fluoride for Adults? Honestly, this is the one question to which I don’t have a good answer, because the fact that they don’t, makes absolutely ZERO sense to me. Since it’s good for preventing tooth decay, you’d think they would cover it for adults, too. After all, almost all insurance companies are for-profit, and you’d think they would cover everything that would reduce the amount they pay out. So the only answer I can give is the one from my gut: they don’t cover it simply because they’ve never covered it. You know – since it’s always been that way, why should they change? Admittedly, most adults don’t need fluoride treatment, because their teeth are already fully formed, and fluoride is most beneficial when the teeth are still growing in and developing. Adults with good home care and healthy diet that is low in sugars and acids, with little or no history of dental decay, really wouldn’t benefit from additional fluoride. However, for those adults with a long history of cavities, you should definitely talk to your dentist about getting fluoride varnish treatments on a regular basis, as it can still help to reduce your risk of new cavities, even if your insurance doesn’t cover it. At only $15-50 per treatment (mostly depending on your location), it’s one of the cheapest and most effective ways to cut down on your dental bill. 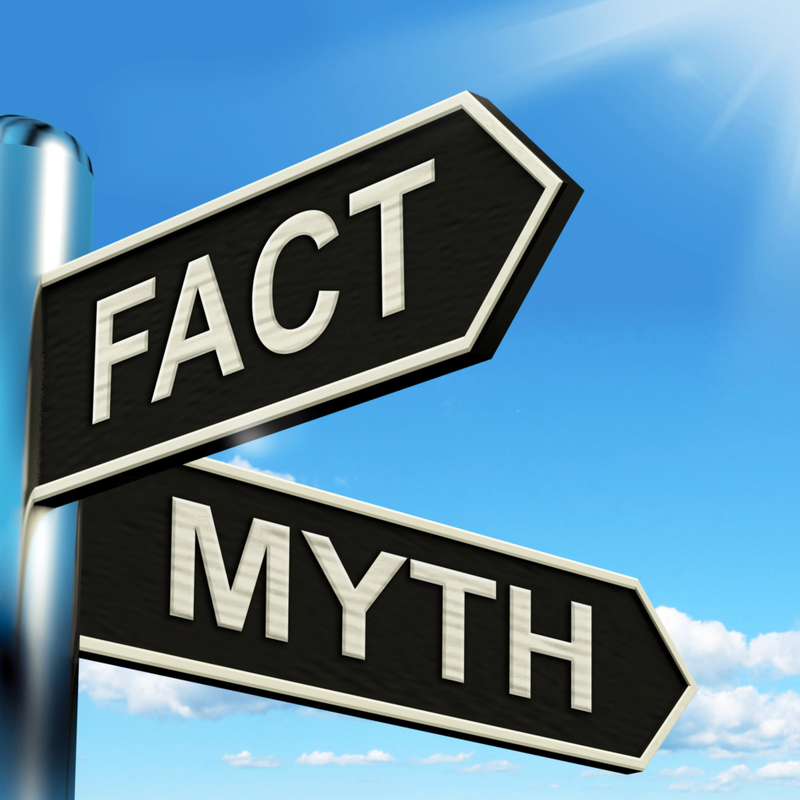 Unfortunately, there are a lot of myths on the web about fluoride, and some of them even seem to come from reputable sources, so how do you know what’s real and what’s bogus? I was going to write a nice list, but in my research, I came upon a website that has already done all the work, including debunking the nonsense. It even includes links to excellent scientific research for those who want to dig deep into the data. So here you go: Fluoride Myths and Conspiracies Debunked.